What to Expect — ARTSNCT INC.
As an alliance of the arts, the mission of ARTSNCT is to actively support and promote the education of the arts through training, performance, exhibition, publication, and other means possible. 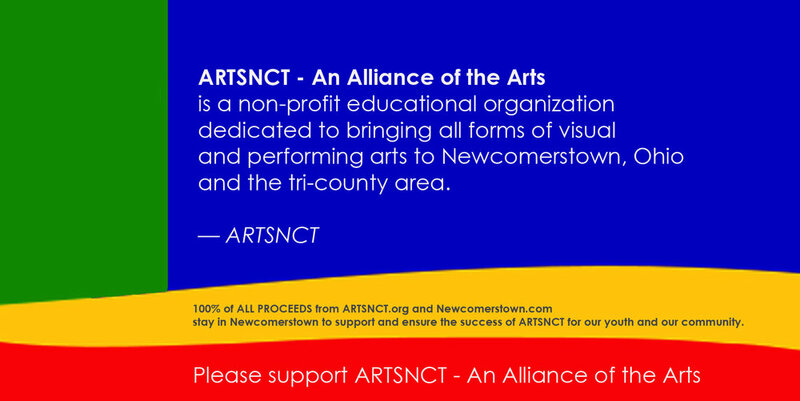 ARTSNCT INC. is currently recognized by the State of Ohio as a nonprofit charity organization dedicated to bringing all forms of visual and performing arts to Newcomerstown, Ohio and the tri-county area. We are seeking IRS 501(c)3 status and hope to have it in place soon. 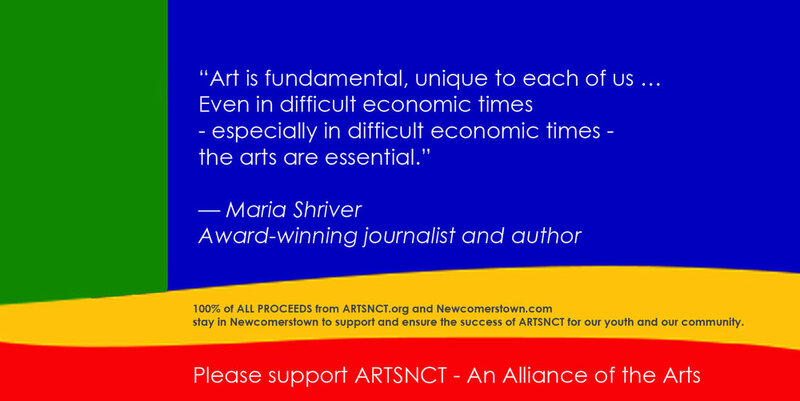 100% of ALL PROCEEDS from ARTSNCT.org and Newcomerstown.com stay in Newcomerstown to support and ensure the success of ARTSNCT for our youth and our community. (January – December) – When available, ARTSNCT provides free entertainment to the local senior citizens center, nursing homes, schools, churches, and meetings & banquets of community organizations. This gives artists and performers an opportunity to gain valuable experience in front of a live audience that will aid in developing their skills, talent, and creativity. ARTSNCT also produces 3-4 full length plays or musical productions each year that are presented to the local community by its own theatre group, the Not Your Average Theatre Group. (January – December) - ARTSNCT offers various photography programs that provide instruction and hands-on experience. The photography group is assigned goals and then travels together while taking photos of architecture, animals, flowers, the moon, etc. Finished prints are then put on exhibit for public viewing. (January – December) - ARTSNCT exhibits and aids artists in the sales of their works. Ohio artists, as well as local artists are represented by ARTSNCT in many mediums. An event to Inspire the creation and design of artistic Valentine cards, boxes, poetry, paintings, and photos through instructional workshops and creative interaction. The celebration concludes with a fundraiser party where the artwork is presented. ARTSNCT coordinates, promotes, and provides a number of instructional and performance programs in art, music, dance, and theatre. 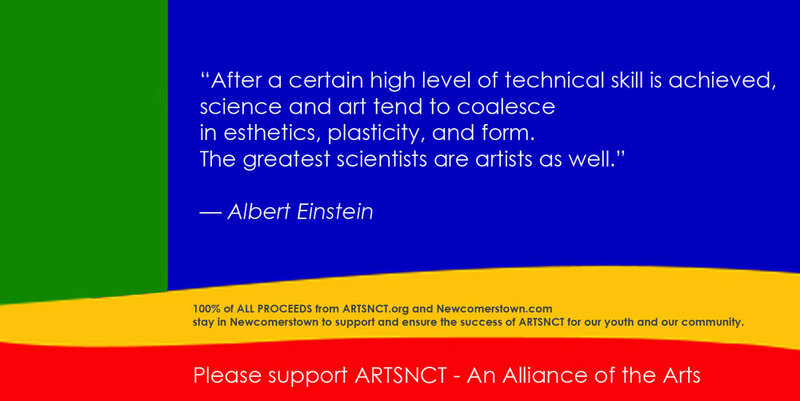 ARTSNCT will work with the public schools to help promote their various arts programs and events. A whimsical Easter bonnet design and creation contest is followed by a grand promenade to inspire imagination and creativity in youth and adults alike. Amateur photographers are instructed in photo shoots that present the bonnets in print and publication. ARTSNCT coordinates, promotes, and provides a number of programs, including photography instruction and exhibition. A celebration of Spring with a Kite Making and Flying Contest. It inspires the design and construction of beautifully artistic and functional kites. Amateur photographers are instructed in photo shoots that present the kites in print and publication. The festival includes a traditional 'May Pole' dance. (June-September) – Indoor and outdoor concerts arranged with local musicians and performers are open to the public at no cost. (June – September) – ARTSNCT promotes local contemporary craft and art by providing an outdoor venue and promoting the event with specialized advertising in print and online. Crafters and artists keep 100% of their sales from the market. Various entertainment is also featured. An annual two-week day camp to educate and inspire youth about the visual and performing arts. The end of the camp culminates at the time of the local Cy Young Days Festival where the youth have an opportunity to exhibit their art or perform. ARTSNCT volunteers at this annual community festival that is organized by the Cy Young Days Committee and the Newcomerstown Chamber of Commerce. The event celebrates the life of Newcomerstown's famous son, Denton True 'Cy' Young. ARTSNCT commands the stage entertainment with bookings, scheduling, and providing a venue for local artists to hone valuable performance skills in front of a live audience. Presented to a native Newcomerstonian for Lifetime Achievement in the Arts. Nominations are submitted by the end of April each year. Honorees for this award must have been born in Newcomerstown or spent a large percentage of their life promoting the arts and education in the Newcomerstown area. Set to be a highly coveted award with a whimsical name (from Newkietown) are for excellence in performing arts. Awards in various categories will be presented to participants (without age restriction) in local productions presented by the local school system, Newcomerstown Historical Society, local churches and other community organizations, as well as ARTSNCT. A special 4th of July celebration highlighted with the presentation of patriotic art and music. ARTSNCT volunteers at this annual community festival that is organized by the Thomas L. Little Foundation to fund scholarships for local students and assist needy families. 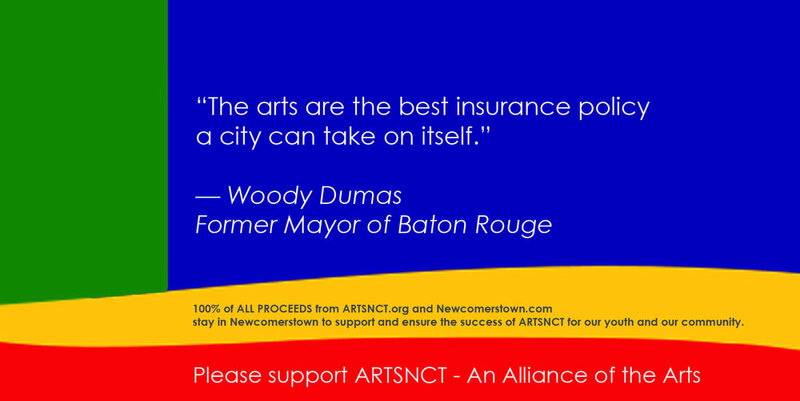 ARTSNCT commands the stage entertainment with bookings, scheduling, and providing a venue for local artists to hone valuable performance skills in front of a live audience. 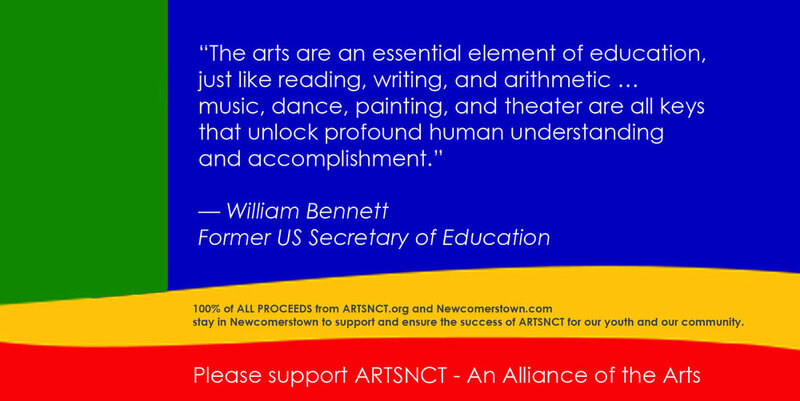 ARTSNCT coordinates, promotes, and provides a number of programs in art, music, dance, and theatre in cooperation with local schools. 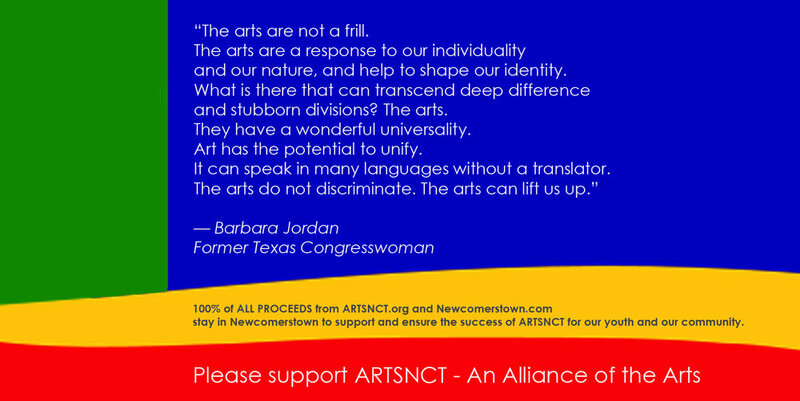 ARTSNCT coordinates, promotes, and provides a number of programs in art, music, dance, and theatre. A festive event for youth and adults alike to inspire imaginative and creative costume and makeup design, as well as creative photography and filmmaking. Emphasis is placed on the creation of objects of art made with reclaimed and repurposed items. ARTSNCT organizes, schedules, promotes, and produces twelve days of various holiday programs and events with the cooperation of the village, local schools, churches, and community organizations. The twelve events consist of art, music, and performance events such as holiday concerts, parades, pageants, plays, art and design of holiday decorations ... and Santa. All events are open to the public and promote the arts with a hometown holiday spirit. It is hoped that this will ontinue as an annual event that will bring tourism to the village and create cherished memories for youth and adults alike. ARTSNCT recognizes individuals and businesses for dazzling and artistic displays of trees and lights, featuring the community Christmas tree adorned with an abundance of beautiful handmade ornaments and decorations. An annual New Year's Eve celebration of art and music. Open to the community. Plays, Musicals, Dance, Concerts, Competitions, Stand-up Comedy and more. Painting, Sculpting, Crafts, Photography, Design, Film Making and more. Classes, Workshops, Seminars, Private Tutoring and Instruction.